Victor Ananias has an interesting multicultural background, his father being from Chile and his mother from Turkey, growing up for the first five years in Germany and then moving to Turkey. While searching as a young man for global answers to present environmental and social problems of our society he founded the Bugday Association 17 years ago. Parallel to this Victor Ananias initiated and managed an ecological-cultural learning center in Bodrum for nine years. Ten years ago he started the Ecological Living magazine and opened the first organic store in Istanbul. It is fair to say that he is the leading pioneer promoter of the organic movement in Turkey. He is a “glocal” (global/ local) activist working e.g. in IFOAM, the European Environmental Bureau, establishing Willing Workers On Organic Farms and cooperating with eco-tourism NGO ECEAT on the agro-eco-tourism project TaTuTa. Victor Ananias has extraordinary skills in networking and uniting people for a common cause. He is highly respected by citizens and the NGO community in Turkey as well as at official and government level. With a focus on organic agriculture and environmental protection he has dedicated his life to promoting and developing sustainable living in its broadest sense. The Bugday Association has around 800 registered members, but counts on about 3.000 people as supporters and volunteers. They work with over 1.000 organic farmers and unite people from many sectors. Depending on funding and projects, between 10 and 15 people work for the association. A very recent development is the merger of the Bugday Association with DOGA (nature society and the Turkish bird protection organization). The association pioneered regional and national organic marketing and was instrumental that now over 300 organic stores and sales points have been established in the country. 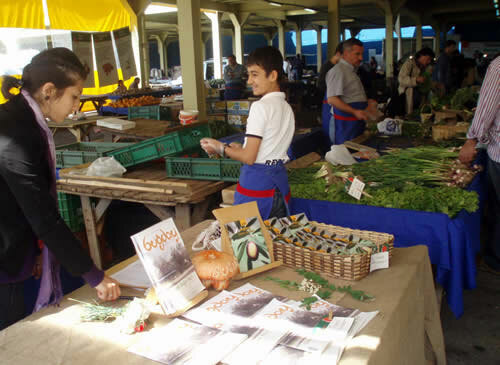 The most recent success story is the establishment and successful management of a big weekly farmers’ market in Istanbul, which gives around 300 organic farmers and companies a sales outlet. About 3.000 customers/families come each Saturday to this market, which features “100 % organic” guaranteed by strict controls. The success has led to the fact that now a second market on the Asian side of Istanbul has opened and three more big cities are ready to work with Bugday to start organic markets in their cities. The association is also the leading liaison and expert partner for the government in setting up organic regulations and promoting organic agriculture. They publish a lot of brochures and with the 53 issues of the magazine they have circulated about 250.000 copies, making the publication into a major source of knowledge, motivation and inspiration for the environmental organic movement in the country. Also working successfully through TV, radio and print media they have reached out to many hundreds of thousands of people at fairs, festivals and other occasions. Victor Ananias and Bugday are show case examples how charismatic people and well managed associations can work for the benefit of farmers and the organic movement.